Bring you money next Wednesday & Thursday so you have an opportunity to Soak A Teacher. 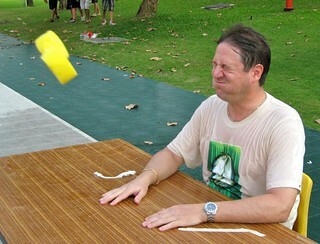 20 baht will get you three sponges to throw at one of your teachers and 50 baht will get you a bucket! All the proceeds will go to Rainbow House, a local organizations that helps kids with mild disabilities. Check out who will be getting wet this year. This entry was posted on 01/05/2013 at 1:44 PM and is filed under Events. You can follow any responses to this entry through the RSS 2.0 feed.